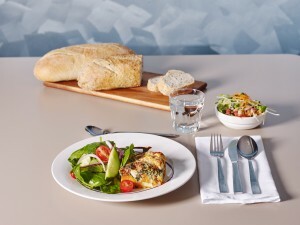 We believe meal time is a social time, vitally important to health and wellbeing. It is because of this that we plan and cook our nutritious meals on site using fresh, seasonal produce. We always purchase our fresh produce from local Benalla businesses, where possible. When at Cooinda Benalla, you’ll enjoy lunch as the main meal of the day. You’ll gather with others to enjoy your meal and social connection in one of three dining rooms. Your lunch meal will have a choice of two main courses and a dessert. Breakfast is service is a continental style breakfast six mornings a week, with a full cooked breakfast served on the seventh day. The evening meal is a lighter style menu that is still nutrious and full of flavour. Hence, in the cooler months it often a nutrious, homecooked soup served with bread and a choice of pasta or sandwiches. In the warmer months the menu will adapt by offering cold meat and salads. You can be sure, dessert is always to follow. Join your family or friends for a meal at Cooinda. We encourage gatherings for loved ones to celebrate special occassions or to connect over a meal. Talk to our Health, Wellbeing and Lifestyle team about your plans, so we can make it a memorable occassion for you all. Each month, the ‘pop up’ Cooinda Instant Restaurant sees four families gather with their loved ones for a special restaurant lunch in Cooinda. Planned and served by our Health, Wellbeing and Lifestyle team, individual’s who are going are asked which meals they would like. Family visit the restaurant to enjoy special time in a relaxed, informal restaurant style setting.